When I found out I was pregnant for Little Dude the first while seemed to be all about the stuff… finding out what we would need, asking friends for advice and of course planning ultra special pregnant announcements for our family, friends and of course, on social media. This time around it seems like there is little to no preparation to be done since we have so many things we can re-use for Baby #2 thanks to the investments and subconscious planning we did when making our purchases the first time around. I saw this type of post on Jillian Harris’ blog a little while back (she recently had her darling Baby #2) and thought since our lists had some similar items but differ in the brands we chose etc. it would be a fun list for all of you to have a look at. Whether you’re in the nesting stage for your first or second child I hope this list will give you a few ideas and help you make some investment (because some of the items are not cheap!) decisions that will last for as many children as you decide to welcome into your family. We spent (well actually, my parents generously spent) the most amount of money on this item, the UppaBaby Vista Stroller (I have the 2015 model). I researched for what seemed like forever which stroller we should get… the Bugaboo Indie stroller was a top contender but several friends were regretting purchasing it once they decide to have a second child because they loved it so much they were then investing yet again for the double stroller version. Even though I had no idea if I would’ve a second child or not I knew purchasing a stroller that had the ability to transport multiple children would be valuable. If I didn’t use the feature I was sure it would come in handy for other members of my family I could pass the stroller down to when we were finished with it – in the end, I’m pretty pumped I went with this option and now will just add the rumble seat or skate board option for Little Dude to tag along. If you want to know more about the stroller feel free to ask, I could go on and on about how awesome it is and all the great features it has (like a basinet rated for sleeping that Little Dude slept in for his first three months and Baby #2 will use as well). I was looking for the safest, lightest, most adaptable car seat on the market and ended up with the Maxi Cosi Mico. It met all of my criteria and was able to work with the UppaBaby Vista stroller so it was a win-win-win. I’m not going to lie, we used the Mama Roo swing A LOT (Thanks to my mother-in-law and sister-in-law for this awesome gift!). Little Dude slept in it many times, played in it, heck he probably ate in from time to time. There are many swing options on the market, but living in our small space (our previous home was only 1000 square feet) choosing a space saving option was essential. Also, since we used it so much I would highly recommend getting a swing that pugs in unless you’re prepared to spend a small fortune on batteries. To be fair we actually used two. The original high chair we had and used all the time was a Fisher Price space saver high chair. It was affordable and great for saving space (just as the name suggests) and had features to suit babies from the beginning (when they are not great sitters) to toddler age. 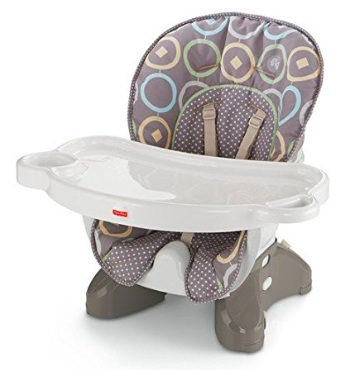 However it wasn’t the best to travel with so as Little Dude grew we ended up buying a second high chair, Cosco brand, that folds really small and can easily be stored away to use at home and to bring with us on week long visits to the in-law’s house etc. Scout is certainly more of a toy than an “item” per say, but we used the nighttime sleeping music to help at bedtime, used him as a toy to get Little Dude to smile for pictures and as he got older to help teach him all kinds of things. I have also purchased this as a baby shower gift a few times… Scout (or Violet) are great! I went with a very standard crib (from IKEA) and was determined not to over pay in order to have the ability to splurge a little on bedding. I am re-using both the crib and the mattress but will update the bed sheets and sleep sac to freshen things up for Baby #2. I have the Born Free Bottle Genius, but its a little tough to find these days so if I was buying another one I would go with the Baby Brezza Formula Pro. It looks to have the same features and have the same amazing convenience factor that makes this machine a lifesaver for parents using formula. For the price, to give you the option to push a button in the middle of the night and have a a bottle perfectly measured at the perfect temperature in 30 seconds you simply can’t go wrong! The boon drying rack is super easy to clean, looks good in the kitchen and fits right on the window sill above my kitchen sink. I still use this item even now nearly three years later so it is certainly a keeper. I also use the flower drying accessory which makes the rack complete in my opinion. I do plan on upgrading the bottles for Baby #2 similar to the bedding…just to freshen things up a little. The Fisher Price bath tub we received as a gift was the perfect tub to use outside the “real bath tub”, have inside and the sling was perfect for even the smallest of babies. Eventually when the baby is big enough not to need the sling, it doubles as both toy storage bag. These two items I swear by and they are a little more for mom and dad than baby but thats what makes them awesome baby shower gifts! I received the Skip Hop bath tub kneeler at my shower and shortly after purchased the elbow rest. I still use both items every time I give Little Dude a bath and can’t see them leaving our bathroom anytime soon. This thing doesn’t look like much but it is the absolute simplest contraption to have for your infant’s carseat, carrier or stroller during the winter months. I used it all of Little Dude’s first winter (he was a late fall baby) and into the second winter (more in the stroller and carrier). Baby #2 is expected to arrive in the middle of the winter so I’m sure the Pookie Poncho will come in handy at least for two more winter seasons. I wish I had known about this thing earlier with Little Dude! Thankfully the Munch Mitt is 100% washable (machine wash even!) so I can get the full use out of it for Baby #2. From the minute I announced I was pregnant with Little Dude people started giving me suggestions on what type of activity contraptions he needed. We ended up receiving two activity stations as gifts (I was amazed how generous our family and friends were!) – one was an exersaucer and although Little Dude loved plying in it he had a hard time actually jumping and when he finally did figure it out the toy was super loud (and kind of annoying) for us parents. This one however, the Baby Einstein Activity Jumper, he could jump in from day 1 almost (he started using it at 3.5 months old or so) he loved the toys and it was MUCH quieter. We will likely use both of them again this time, but this on will be the one I put in our living room and in the areas where it will get used the most. Great list. I loved my stroller too… and it was perfect for all three of my boys! Girl I didn't even know you were pregnant again – where have I been???? Congrats! This is so exciting!